It began several days ago when this post was made on Ravelry. That post introduced me to this pattern. While clearing my Grandpa’s house, a rather large bag of brand new corks appeared. What else could I do. Cousins and Aunts were consulted as to whether I could take the corks. An agreement was reached. 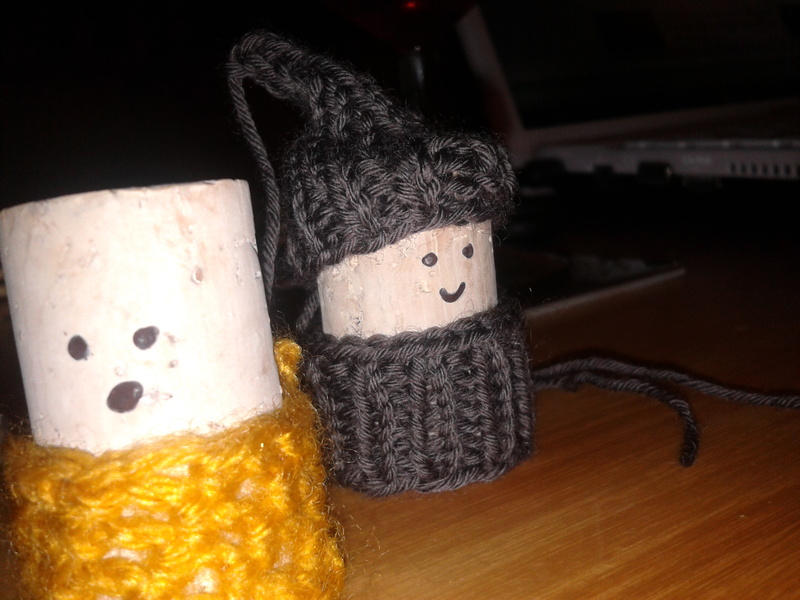 I could have said corks providing Korknisse (in selected colours) were created and delivered to said individuals. Later this evening (after wine admittedly), my Mum and I are wondering if we can get sufficient numbers made to populate the Wake next Wednesday. Grandpa had a rather silly sense of humour, and we think he would have approved. Now we need to convince the rest of family. The Korknisse army are massing and will present themselves at my Aunt’s house tomorrow afternoon – preferably in random places. Tags: Korknisse, NaBloPoMo | Permalink.